A lower corporate tax rate and new limitations on interest deductibility will make it much harder for the Nordstrom family to lead a leveraged buyout of their namesake company. Six months ago, the Nordstrom (NYSE:JWN) founding family began exploring the possibility of taking the company private. The idea was that removing the pressure of quarterly earnings reports would give Nordstrom more flexibility to make long-term investments that would help the business adjust to changing consumer behavior. In October, the Nordstrom family paused its efforts to take the company private after potential lenders demanded interest rates as high as 13%. At the time, the family said it would resume its exploration of a go-private transaction in early 2018. However, the tax-reform bill recently approved by Congress means that taking the company private probably won't make sense. Nordstrom stock was trading for a little more than $40 before the Nordstrom family announced its interest in taking the company private. The stock quickly spiked higher, to around $48. After the family put negotiations on hold in October, those gains quickly evaporated. However, Nordstrom stock has recovered all the way to $47 in recent weeks. Positive signs for retail sales and the recently passed tax-reform bill were the two main drivers of this move. Nordstrom Stock 2017 Performance, data by YCharts. First, retail sales trends appear to have improved recently. While Nordstrom hasn't provided any details on its performance since the beginning of the fourth quarter, several other department store chains achieved strong sales results in November. Furthermore, chain-store sales growth has been very strong for the past several weeks, according to the Redbook index. Second, the tax-reform bill passed last week cuts the statutory corporate tax rate from 35% to 21%. For companies like Nordstrom that earn most of their income in the U.S. and don't benefit from many deductions, this should boost earnings per share (EPS) by as much as 25%. Last month, Nordstrom updated its fiscal 2017 EPS guidance range to $2.85-$2.95. Based on that level of earnings, investors might have welcomed a buyout in the $50-$60 range. But a 25% boost from tax reform and the potential lift from stronger sales trends could drive Nordstrom's EPS above $4 in fiscal 2018. (The maturing of Nordstrom's growth initiatives could provide an additional EPS tailwind next year.) This will increase the cost of any serious buyout proposal. Nordstrom's growth initiatives, such as Trunk Club, are starting to mature. Image source: Nordstrom. Meanwhile, the new tax law also includes restrictions on interest deductibility: a change that will make leveraged buyouts less profitable. For the next several years, companies will only be allowed to deduct interest payments on their tax returns up to 30% of earnings before interest, taxes, depreciation, and amortization (EBITDA). Beginning in 2022, restrictions on interest deductibility will become even tighter. This isn't a problem for Nordstrom now. In fiscal 2016, EBITDA was approximately $1.45 billion, or $1.65 billion excluding a goodwill impairment charge. Meanwhile, interest expense was just $121 million. If EBITDA remains stable going forward, Nordstrom would be able to deduct about $500 million of interest annually. However, Nordstrom might need to borrow another $8 billion to go private. Even if it were able to negotiate the interest rate down to 8%-9%, its interest expense would exceed the cap on deductibility by hundreds of millions of dollars. The net result is that Nordstrom would have a higher effective tax rate as a private company than it would if it remained public. That makes going private a lot less attractive. A buyout by the Nordstrom family may seem attractive to many investors, due to the upheaval sweeping through the retail sector today. But as a Nordstrom shareholder myself, I have had mixed feelings about this potential deal from day one. In recent years, Nordstrom's profitability has been held down by a combination of operational missteps and costly investments meant to drive long-term growth. That said, Nordstrom's investment cycle is already starting to wind down. 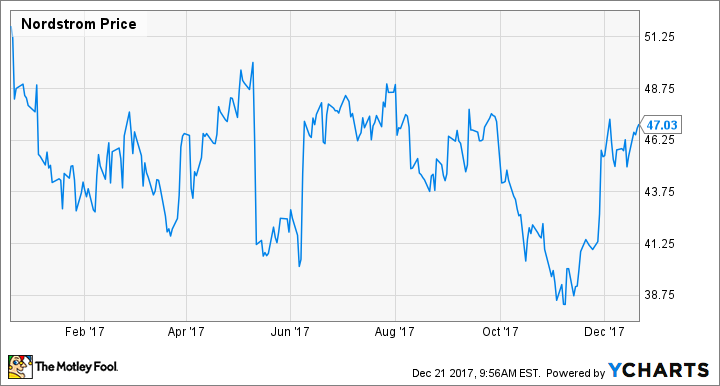 This means that, if Nordstrom improves its execution, it could deliver strong growth in earnings and free cash flow over the next several years. In the long run, Nordstrom investors might profit more by being patient than they would from selling their shares at a premium as part of a leveraged buyout.